Often in the Scriptures, we read of the judgments of God and gasp as we see Israel and other nations suffering under the Lord’s power. While the judgments of God are difficult, we must understand that all through the Old Testament God is showing grace and mercy. In the prophets, He calls for people to turn from their wicked ways and He will forgive them. You see, while God’s discipline can often seem extreme, His love is just as potent. Love to the Extreme – that is what the God of all creation has shown towards us. While we were steeped in sin and suffering under the weight of condemnation, He stepped out of heaven and gave His life for ours. The punishment that we deserved was placed upon Jesus on the cross. Each strike of the nails that pierced His hands was done so that we could know forgiveness. Each cruel word and slash of the whip on Jesus’ body happened so that we could spend eternity with Him. All we have to do is come to Jesus seeking forgiveness and trusting in Him for salvation. As we do, we take part in the greatest love anyone could ever know. Heavenly Father, I know that I have done and sometimes do wrong. Today, I come to You and ask that You would forgive me of all my sins. I confess that Jesus is Lord and I believe that He died for my sins and was raised from the grave three days later. Lord, make me a new creation and fill me with Your Spirit so that I can live for You. In Jesus’ name, Amen. This entry was posted in Ask Jesus into your heart, Forgiveness, General Devotions, God's Love, God's Will, Grace, Grace and Mercy, Greatfulness, Healing, hope, Love, Meekness and Gentleness, SIN, Spirtual Warfare, Uncategorized and tagged Ask Jesus into your Heart, Forgiveness, General Devotions, God Loves You, God's Love, God's love for you, God's Will, Grace, Grace and Mercy, Greatfulness, Healing, hope, I Loved You At Your Darkest Hour, Love, Love to the Extreme, Meekness and Gentleness, Rob Lavallee, Romans 5:8, Scriptural Seeds Ministries, SIN, Uncategorized and tagged Amos 4:9, www.scripturalseeds.org on April 14, 2019 by Rob Lavallee. Many picture God as some kind of cranky old man out to ruin our lives. But the reality is that God loves you! He misses you. He wants a relationship with you. Look at the Lord in the garden after Adam’s fall, calling, “Adam, where are you?” (Genesis 3:9). The world? That includes Those that would cause us harm. It includes criminals, adulterers, cheats, liars, even murderers. The thief on the cross was probably a murderer or terrorist, but Jesus extended His loving forgiveness to him. We can talk about love all day long, but God demonstrated His love for us in a tangible way. Romans 5:8 says,” But God demonstrates His own love toward us, in that while we were still sinners, Christ died for us,” and Romans 6:23 tells us that “the gift of God is eternal life in Christ Jesus our Lord.” Jesus came to this world not to come down on people, but to reach out to people. While religion tells us what we must do to reach up to Heaven, God reaches down from Heaven in sending Jesus and pulling us off of the road leading to the depths of hell. Revelation 20:15 says, “Whosoever was not found written in the book of life was cast into the lake of fire”. If you are included in the “whosoever” of John 3:16, you won’t be included in the “whosoever” described in Revelation 20:15. “These things have I written unto you that believe on the name of the Son of God, that you may know that you have eternal life and that you may believe on the name of the Son of God”. The Maker of all creation gave to us. He did not give to us because we were worth it or because we had something to offer. He gave because He loved. The moment God became flesh was the most perfect act of love in history. Jesus left the glories of heaven and the throne of His Father and came into the tiny town of Bethlehem as a baby. With this act, God declared to all of humanity, “You are not alone.” Jesus did not come into Bethlehem bringing condemnation. He came so that He could give His life so that our sins could be forgiven. This is the greatest gift you will ever receive, but like all gifts you must open it first. Seeking Jesus in your life? If you have not asked Jesus into your life you can receive Jesus Christ right now by faith through prayer. Lord Jesus, I want to know you personally. Thank you for dying on the cross for my sins. I open the door of my life and receive you as my Saviour and Lord. Thank you for forgiving me of my sins and giving me eternal life. Take control of my life. Make me the kind of person You want me to be. If you have done this, then congratulations! (Luke 15:7) says that when one sinner accepts Jesus Christ as his or her Saviour the angels rejoice. So there’s a party going on in heaven right now over your decision! Remember this date as your “second birthday,” the day you were born into a new life in Christ! You have God’s Word that he answered your prayer. This entry was posted in Ask Jesus into your heart, Fellowship, Focus on God, Forgiveness, General Devotions, God's Love, God's Will, Goodness, Grace and Mercy, Greatfulness, holy spirit, hope, Joy and Happiness, Kindness and Compassion, Love, Meekness and Gentleness, Repentance, Salvation, Signs and Wonders, The Good News, Uncategorized and tagged For God So Loved the World, Forgiveness, Genesis 3:9, Gods Love for us, James 2:19, John 3:16, John 5:13, Repentance, Revelation 20:15, Rob Lavallee, Romans 5:8, Romans 6:23, Salvation, Scriptural Seeds Ministries, Top Blogs, www.scripturalseeds.org on October 4, 2018 by Rob Lavallee. Many people make the mistake of believing that God forgives “little” sins such as lying, anger, and impure thoughts, but does not forgive “big” sins such as murder and adultery. This is not true. There is no sin too big that God cannot forgive. When Jesus died on the cross, He died to pay the penalty for all of the sins of the entire world. When a person repents and ask for forgiveness, then places his faith in Jesus Christ for salvation, all of his sins are forgiven. That includes past, present, and future, big or small. Jesus died to pay the penalty for all of our sins, and once they are forgiven, they are all forgiven. We are all guilty of sin (Romans 3:23) and deserve eternal punishment (Romans 6:23). Jesus died for us, to pay our penalty (Romans 5:8). Anyone who believes in Jesus Christ for salvation is forgiven, no matter what sins he has committed. Now, a murderer, thieves or adulterer may likely still face serious consequences such as (legal, relational, etc.) for his evil actions – more so than someone who was “just” a liar. But a murderer’s or adulterer’s sins are completely and permanently forgiven the moment he believes and places his faith in Christ. It is not the size of the sin that is the determining factor here; it is the size of the atoning sacrifice of Christ. If the shed blood of the sinless Lamb of God is sufficient to cover all the sins of all the millions of people who would ever believe in Him, then there can be no limit to the size or types of sins covered. When He said, “It is finished,” sin was made an end of, full atonement and satisfaction for it were given, complete pardon was obtained, peace was made, and redemption from all sin was achieved. It was sure and certain and complete; nothing needs to be, or could be, added to it. Further, it was done entirely without the help of man, and cannot be undone. God loves us more deeply than I think we’ll ever know, but He hates our sin with a passion. That’s why He sent Jesus to die for us, so that our sin could be removed. Sin forms a wall between man and God, even in a believer’s life. The Blood of Jesus is the only thing capable of removing such a wall. When we repent (confess and forsake our sin), it opens the flood-gates to receive our heavenly Father’s rich blessings and goodness in our lives! If today’s message applies to you, please seek Jesus in prayer and ask for forgiveness. If you do not know Jesus personally and are at this website, please know that it is by no mistake. Please consider praying the prayer with me below. This entry was posted in Ask Jesus into your heart, Forgiveness, General Devotions, Grace and Mercy, Meekness and Gentleness, Praise and Worship, Repentance, Uncategorized and tagged 1 John 1:9, 1 John 2:2, Acts 10:43, Ask Jesus into your Heart, Colossians 1:14, It Can Be Forgiven, Repentance, Rob Lavallee, Romans 3:23, Romans 5:8, Romans 6:23, Salvation, Scriptural Seeds Ministries, www.scripturalseeds.org on June 26, 2018 by Rob Lavallee. This entry was posted in Ask Jesus into your heart, Forgiveness, General Devotions, God's Love, God's Will, Grace, Grace and Mercy, Greatfulness, Healing, hope, Love, Meekness and Gentleness, SIN, Uncategorized and tagged Amos 4:9, God Loves You, God's love for you, I Loved You At Your Darkest Hour, Love to the Extreme, Rob Lavallee, Romans 5:8, Scriptural Seeds Ministries, www.scripturalseeds.org on May 3, 2018 by Rob Lavallee. As Jesus made His triumphal entry into Jerusalem on what we know as Palm Sunday, He looked at the city and wept. In the hebrew language, the word used to describe His weeping speaks of bitter anguish, as though one first were mourning the death of a loved one. Jesus cried with such pain because He knew what was next to come. His time was short. He had been rejected by mankind. He had healed their sick. He had raised their dead. He had cleansed their lepers. He had fed their hungry and forgave their sins. But He remained mostly alone and rejected. He also knew one of His own, Judas Iscariot, was about to betray Him. Judas was a friend of Jesus’. That is why it was a betrayal. Jesus knew that Caiaphas, the high priest, would try Him on false charges. Jesus knew that He would be sent to the Roman governor Pontius Pilate and ultimately be sentenced to die on the cross. He knew the people who were crying, “Hosanna!” And that the majority would turn against them. And it broke His heart. Jesus knew they would face the repercussions for their sin, and He didn’t want that. However, God will not force His forgiveness on to anyone. I have friends and also family who have made wrong decisions in life, despite the warnings in God’s written word. Despite counsel from thier Pastor or Christian friends not to do a certain thing. They do it anyways, then later they come back and say, “Oh, I should have listened. God will not violate our free will. God will not make us believe. God will not make us love Him. If we don’t want to, we don’t have to. But that is what is so amazing. God, having foreknowledge, still loves us and still extends his grace to us. Heavenly Father, Thank You for my church, my friends and the ones that love me. Thank You for the amazing comfort that I can find with You. Please refill my spirit daily because I don’t often make good decisions on my own. I praise you for not forsaking me in the times that I don’t listen. Because of Your love, I can have peace and forgiveness for all my sins. Because of You Lord, I am free from the penalty of sin and no matter what happens on this earth, I will be healed and loved for all eternity. Father, help me to remember these things and to pass them on to those who are thirsting for Your refreshing comfort. In Jesus’ name, Amen. Seeking Jesus? Pray this prayer with me. If you have prayed this prayer, Congratulations! (Luke 15:7) says that when one sinner accepts Jesus Christ as his or her Saviour the angels rejoice. So there’s a party going on in heaven right now over your decision! Remember this date as your “second birthday,” the day you were born into a new life in Christ! You have God’s Word that he answered your prayer. Don’t go through the troubles in life alone. If you have not accepted Jesus Christ as your Savior, Click Here to read Four Simple Steps to Jesus. This entry was posted in Ask Jesus into your heart, God's Love, Grace and Mercy, Uncategorized and tagged Addictions, Anguish, Feeling Alone, Jesus Wept, Pain, Rob Lavallee, Romans 5:8, Sadness, Scriptural Seeds Ministries, www.scripturalseeds.org on April 28, 2018 by Rob Lavallee. Often in the Scriptures, we read of the judgments of God and gasp as we see Israel and other nations suffering under the Lord’s power. While the judgments of God are difficult, we must understand that all through the Old Testament God is showing grace and mercy. In the prophets, He calls for people to turn from their wicked ways and He will forgive them. You see friend, while God’s discipline can often seem extreme, His love is just as potent. This entry was posted in Ask Jesus into your heart, Communion, Faith, Forgiveness, General Devotions, God's Love, Grace and Mercy, The Good News, Uncategorized and tagged Amos 4:9, Anger, Depression, Encouragement, Family, Gods Love for us, Healing, Hurt, Love, Love Like Jesus, Love to the Extreme, Marriage, Peace, Relationships, Rob Lavallee, Romans 5:8, Scriptural Seeds Ministries, Top Blogs, www.scripturalseeds.org on June 17, 2017 by Rob Lavallee. September 21st 2016 – Are Any Sins Too Big To Be Forgiven by God? Many people make the mistake of believing that God forgives “little” sins such as lying, anger, and impure thoughts, but does not forgive “big” sins such as murder and adultery. This is not true. There is no sin too big that God cannot forgive it. When Jesus died on the cross, He died to pay the penalty for all of the sins of the entire world. 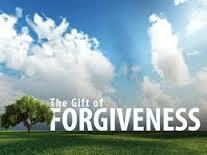 When a person places his faith in Jesus Christ for salvation, all of his sins are forgiven. That includes past, present, and future, big or small. Jesus died to pay the penalty for all of our sins, and once they are forgiven, they are all forgiven. We are all guilty of sin (Romans 3:23) and deserve eternal punishment (Romans 6:23). Jesus died for us, to pay our penalty (Romans 5:8). Anyone who believes in Jesus Christ for salvation is forgiven, no matter what sins he has committed (Romans 6:23; John 3:16). Now, a murderer, thieves or adulterer will likely still face serious consequences such as (legal, relational, etc.) for his evil actions – more so than someone who was “just” a liar. But a murderer’s or adulterer’s sins are completely and permanently forgiven the moment he believes and places his faith in Christ. This entry was posted in Ask Jesus into your heart, Cleansed, Forgiveness, God's Love, Grace, Grace and Mercy, Uncategorized and tagged 1 John 1:9, 1 John 2:2, Acts 10:43, Are Any Sins Too Big To Be Forgiven by God?, Colossians 1:14, John 3:16, Romans 3:23, Romans 5:8, Romans 6:23 on September 21, 2016 by Rob Lavallee. September 6th 2015 – Are any sins too big to be forgiven by God? We are all guilty of sin (Romans 3:23) and deserve eternal punishment (Romans 6:23). Jesus died for us, to pay our penalty (Romans 5:8). Anyone who believes in Jesus Christ for salvation is forgiven, no matter what sins he has committed (Romans 6:23; John 3:16). Now, a murderer or adulterer will likely still face serious consequences such as (legal, relational, etc.) for his evil actions – more so than someone who was “just” a liar. But a murderer’s or adulterer’s sins are completely and permanently forgiven the moment he believes and places his faith in Christ. If today’s message applies to you, please seek Jesus in prayer and and ask for forgiveness. If you do not know Jesus personally and are at this website, please know that it is by no mistake. Please consider praying the prayer with me below. This entry was posted in Forgiveness and tagged 1 John 1:9, 1 John 2:2, Acts 10:43, Ask Jesus into your Heart, Bible, blessings, Celebrate Recovery, Christian, Christian Devotion, Christian devotions, Colossians 1:14, Finding Jesus, Forgiveness, General Devotions, God's Word, Gods Grace, Healing, Help me Jesus, Jesus christ, John 3:16, Lamb of God, Rob Lavallee, Romans 3:23, Romans 5:8, Romans 6:23, Scriptural Seeds Ministries, September 6th, Tucson AZ, Tucson AZ Churches, www.scripturalseeds.org on September 6, 2015 by Rob Lavallee.